Sometimes an adrenaline rush like the kind experienced while shooting the rapids with only some inflated rubber between you and a mighty river can be...how should we say this…pure ecstasy, perhaps even better than, well you know. With the knowledge that an experienced whitewater rafting guide can offer, you can be part of a team that will learn to work in harmony very quickly. With each member paddling their oars at just the right times. And as you are led by the guide at the stern through rough water, across and around geological obstacles that offer no give except for thrilling risk itself, we promise that your blood will be pumping. 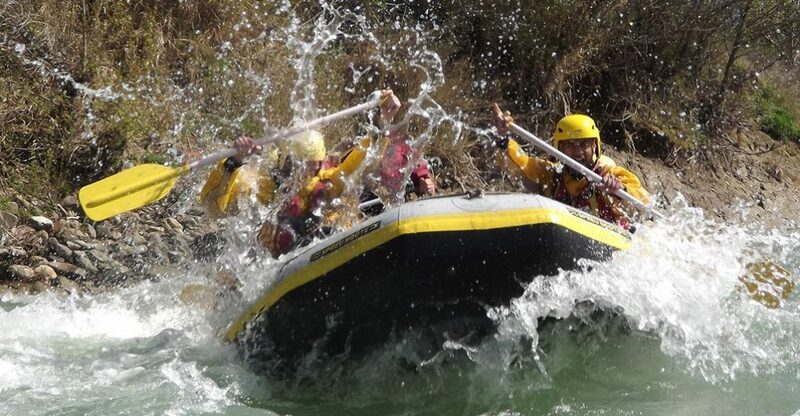 Because there are a bounty of great rivers with experienced guides to help you on your journey towards living life to the highest level of excitement, we here at Campers & Gear have put together this fantastic list of the Top Ten White Water Rafting Experiences. This is the pinnacle of Class III-Class V Whitewater Rafting destinations in the Rocky Mountains. After taking in the spectacular 360-degree view atop one of the world’s highest suspension bridges, you can set out for thrills of unmatched velocity. As you paddle your way to bragging rights, you will be awed by the surrounding 14,000-foot peaks that will take your breath away. For those less experienced or with families, Colorado’s stretch of the Arkansas River also offers Class II-III runs at Granite Gorge and Class III at Browns Canyon. Whichever point of embarkation and section you decide on there are plenty of experienced guides to provide you with a trip to remember. Check out the guides at River Runners. This incredible Class V single day trip is lovingly provided in September and October of each year when the Corps of Engineers lowers the waterline at Summersville Lake for six weekends. If you can steel your nerves and look up long enough, you’ll see the beautiful changing fall foliage. Just don’t stare too long, for there be boulders, big boulders in this stretch of the Gauley River. Don’t let its backwoods Appalachian location fool you; there are cool activities to do when you are not rafting like mountain biking and hiking and even some hip places nearby to grab a drink and some well-earned and tasty sustenance. Check out the guides at Ace Adventure Resort. Once you’ve gotten over the jaw-dropping views of this magnificent National Park, taken your mule rides and panoramic photos, try out the Class V stretch of the Colorado River for an unparalleled check mark on the bucket list. The Grand Canyon’s 226 miles of wild river possibilities range from the aforementioned Class V Whitewater trips all the way down to Class I. There are even well-appointed rafting trips for those of you who prefer a more luxurious expedition. As always the right guides can make all the difference in the world, so a little research can go a long way. Check out the guides at Colorado River Guides. This is advanced Whitewater Rafting and is really most ideal for experienced paddlers who are in excellent physical condition. If this doesn’t currently describe you, don’t worry, the humongous whitewater with its 8-foot drops and granite boulders make for great motivation to whip yourself into the paddler you always wanted to be. The typical rafting season is from July to September, which coincidentally is a great time to visit both Yosemite National Park (40 minutes away) and the cosmopolitan city of San Francisco (3.5 hours away) Definitely do your research when it comes to guides and buy yourself a helmet-mounted action camera. Check out the guides at All-Outdoors California Whitewater Rafting. Smack dab in the middle of the largest contiguous wilderness without roads in the lower 48 states, the Salmon River offers everything from alpine forests to desert canyons. The Main Salmon section is Class III, which means thrilling but accessible to intermediate paddlers. With trips ranging from half-day and single-day trips to seven-day luxury, overnight runs there is bound to be something for everyone. As well the Lower Salmon section which is also a Class III and the more advanced Middle Fork section is fantastic. Before getting gone in the wilderness try a couple of days in Missoula, Montana. Check out the guides at Idaho River Adventures. In the largest non-polar ice field in the world, straddling Glacier Bay National Park, BC Tatshenshini Provincial Park, Kluane National Park, and the Yukon Game Reserve runs the Tatshenshini River. This expedition style of rafting will make even the fish story guy at the water cooler quit talking. During a trip on the Tatshenshini, you will run canyons with views of 15,000-foot peaks, pass by Grizzly Bears, and marvel at icebergs under the midnight sun. This is the kind of rafting trip even true adventurers will only do once in a lifetime, and that is exactly what makes it so special. There are several good expediting outfitters to ensure you have a memorable experience. Pack your camera, and you’ll have smiles for a lifetime. Check out the guides at OARS. This Class III with a little bit of Class IV stream is legendary for wilderness rafting. Whitewater Rafting on the Chattooga River is a great excursion to take part in while visiting the very cool Asheville, North Carolina. The Chattooga River is also close enough to the metropolis of Atlanta, Georgia that missing out on a run on its whitecaps would be a shame. Section IV offers throat tightening Class V rapids as well. Check out the guides at Wildwater Rafting. During the beautiful New England summer season of Maine the Kennebec River offers Class IV thrill rides through thick forest. Just like the Salmon River, the Kennebec isn’t really close to what you might call civilization, so prepare, plan, and pack well. Combine the Whitewater Rafting with some boon docking or truck bed camping. Check out the guides at Moxie Outdoor Adventures. Looking for a great springtime rafting adventure in the Midwest? Look no further than Wisconsin’s very own Peshtigo River and its Roaring Rapids section. The melting snow livens up the Peshtigo every spring, and we promise that a run down this challenging river is just what the Dr. ordered to beat the cabin fever left over from a long Great Lakes winter. You can take a one to two-hour trip for just $40 per person on a weekday and just a few bucks more on the weekends. The season runs from April 1st to May 31st. So don’t miss out! Check out the guides at Thornton's Rafting Resort & Campgrounds. The perfect family river run. Rafting the Snake River Canyon’s eight miles of Class I-III rapids will put a smile on everyone’s face and bring family bonding to a whole new level. It is both scenic and exhilarating without the fear of becoming a permanent stain on a Class V boulder. When you aren’t rafting enjoy Jackson Hole’s Wild West feel. Check out the guides at Mad River Boat Trips. A few tips from your friends at Campers & Gear to make sure you make the most of your experience. Respect the River: Learn the real differences between a Class II and a Class V and don’t be a hero. Classes of rivers range from the real easy Class I to the death-defying Class VI (Notice we don’t have any of those listed) If you can’t swim well, have a bad ticker, are not a team player, or are ill, injured, or infirm find another activity. Dress Appropriately: Most of your equipment (the essential items) will be provided by your guide or expedition organizer. Make sure you take responsibility for wearing the right clothing for the run. We recommend synthetics or wool. Polyester, Fleece, and Nylon garments designed to keep you warm even while wet are best. Just because it’s summer doesn’t mean the water won’t be cold, so ask your guide what they recommend. Other Gear: Leave anything fragile as well as any items you cannot afford to lose behind. That includes your cell phone and wallet. Instead get yourself a good water proof action camera so you can relive your thrills. but shooting the rapids on a Whitewater Rafting trip doesn’t come with a seat belt, so pay attention to the instructions of your guide/s. Gratuity: Your guides may be rugged and accomplished outdoors types, but they still need to eat, so don’t be that person. Tips of 15 to 20% are not only appreciated, it’s the right thing to do. So once again your old buddies at Campers & Gear have put the work in so you don’t have to. I guess that means it’s time to get outdoors and start living the call of the wild. Have fun, stay safe, and make memories for a lifetime!